This month saw the publication of two SRI/ethical investment articles in ‘Investment Life and Pensions Moneyfacts’ magazine. One was written by Moneyfacts editor Richard Eagling, the other by myself. Update October 2017 – replacement link for IFoA literature. Please note this versions may vary from the published text, which is available via the link above. With climate change increasingly in the news it is with great pleasure that I learned that actuaries have recently been issued a ‘risk alert’ from their professional body, instructing them to consider climate risk when advising clients. The possible benefits of this are significant for investors – particularly for pension schemes. Whilst this may not be the most immediately uplifting of subjects the fact that this topic is coming out from the shadows is, in my view, very positive. My hope and expectation is that this marks the start of climate related investment issues being managed, rather than being left to chance. In today’s post COP21 Paris Agreement world, where 195 (now 194) governments have signed up to the objective of keeping global temperature increases ‘well below +2 degrees C’, it is clear that there will be both significant corporate winners and significant corporate losers. Given the magnitude of the implication for investment markets it seems pretty clear that those advising investors should be taking action to protect their clients – from a financial risk perspective and also perhaps from a moral perspective. Morals, intergenerational equity and Al Gore’s 2006 film aside, the economic case for climate action is not new. It was set out in the Stern report ten years ago. Nor is it niche, particularly following COP21 and the establishment of the FSB ‘Taskforce on Climate Related Financial Disclosures’ (which I will come back to shortly). Actuaries should ensure that they understand, and are clear in communicating, the extent to which they have taken account of climate-related risks in any relevant decisions, calculations or advice. There is an increasing body of evidence demonstrating that climate-related issues represent a material risk to future economic stability affecting environmental, societal and governance matters. Many clients of actuaries are exposed to this risk. The implication of this risk warning is clear. Any actuary, pensions specialist or otherwise, who ignores climate related risks will now be falling short of the guidance issued by their professional body. This is good news as it goes further than recent pension rule changes by removing what remains of the ambiguities around this topic – placing climate risk alongside other material, financial risks. A new IFoA report entitled ‘Resource and Environment Issues: A Practical Guide for Pensions Actuaries’ helps explain this topic further. This welcome report highlights risks including rising energy prices, changes in energy supply, changing transport patterns, shortages of resources such as water and base metals, risks to crop yields, pollution and large scale migration – many of which relate to climate risk. “All economic activity is fundamentally reliant on the natural environment for energy and raw materials. It goes on to explain that in 2016, the World Economic Forum identified the ‘global risks of highest concern over the next ten years’, according to a survey of almost 750 diverse experts. The top five risks were identified as; water crises, failure of climate related adaptation and mitigation, extreme weather events, food crises, profound social instability –all of which are commonly associated with climate risk. This indicates that investment decision making will increasingly factor in climate risks – and hopefully opportunities – across a wide range of industry types and investment sectors. 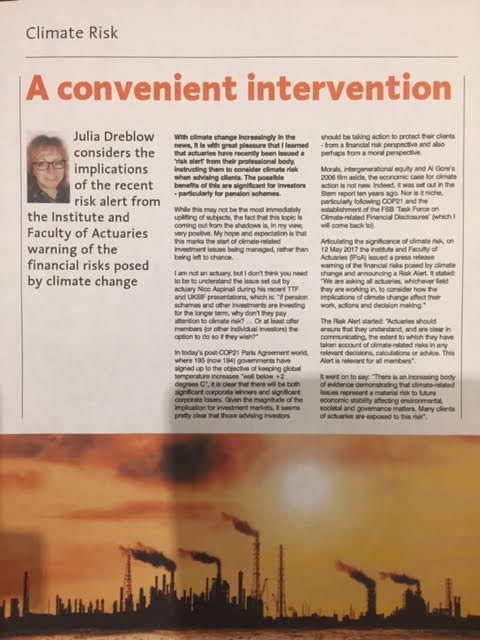 The potential for climate change to materially impact financial markets was formally recognised by the Financial Stability Board a few years ago – and led to the launch of the Taskforce on Climate Related Financial Disclosure during the COP21 Paris climate talks in 2015. 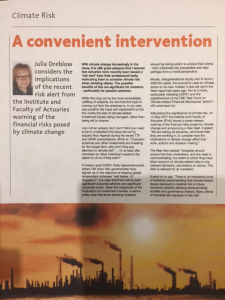 The stated aim of the TCFD is to ‘develop voluntary, consistent climate-related financial risk disclosures for use by companies in providing information to investors, lenders, insurers, and other stakeholders’, which, to precis, means helping to guard against the destabilising effects of climate change for financial markets. The TCFD is fronted by former New York mayor Michael Bloomberg, following his appointment by FSB chair Mark Carney, Governor of the Bank of England. Their full report expected to be published very soon. (See TCFD web link below, or search #TCFRecs on Twitter). One of the biggest challenges for pension and investment practitioners has been a lack of practical support finding appropriate fund options. Specialist research providers such as Ethical Screening Ltd, VigeoEiris, Sustainalytics and MSCI can help, but a useful place to start for fund information is the free to use, fund manager sponsored, online fund hub ‘Fund EcoMarket’. This site was initially intended for financial advisers but is open for all to use. I am not unbiased, as this is the tool my company has created. However, it’s genesis was my own frustration with the lack of reliable, comparable, fund information, which experience had taught me was problematic for advisers and others. find retail funds where ‘climate’ is at the heart of their proposition by searching for Sustainability Themed or Environmental Themed funds, by using the ‘SRI Styles’ filter. find out about relevant company level strategies, such ‘is a boutique/specialist fund manager’, ‘reviewing carbon/fossil fuel exposure across all funds’ plus voting an engagement related options – via a ‘Corporate Activity’ filter. Fund EcoMarket currently shows 364 retail SRI listings. 319 of these are individual ‘screened and themed’ SRI OEIC, life, pension (and other) funds. These options have been segmented according to their SRI Style to highlight their core sustainable and responsible investment (SRI) strategy. All funds are classified by SRI Style so this can be used as an indicator of different options and approaches. (The filter options above are only shown for primary funds, ie not for mirror funds and sub funds). With regard to climate issues, only Social Themed or Faith Based screened funds are unlikely to consider climate as a key issue for their fund. However, as indicated by the different filter options above, the way in which funds respond to climate risk varies significantly both within and between SRI Styles. This diversity points to the fact that there is no single perfect investor response to climate risk. My view is that avoidance (as favoured by many ethical options), positive selection strategies (as favoured by thematic funds) and also active engagement and voting strategies all have crucial roles to play. The fact that different funds follow different strategies is a reflection that not all clients (or trustees, or fund managers) share the same aims and opinions, which in turn offers advisers a chance to demonstrate their worth. So as we await the sequel to Al Gore’s award winning ‘An Inconvenient Truth’ the fact remains that the investment landscape is shifting. So for the benefit of scheme beneficiaries and many others besides… #BeInconvenient! ‘Fund EcoMarket’ SRI fund information hub http://www.FundEcoMarket.co.uk . Julia Dreblow, founder of www.sriServices.co.uk and www.FundEcoMarket.co.uk.